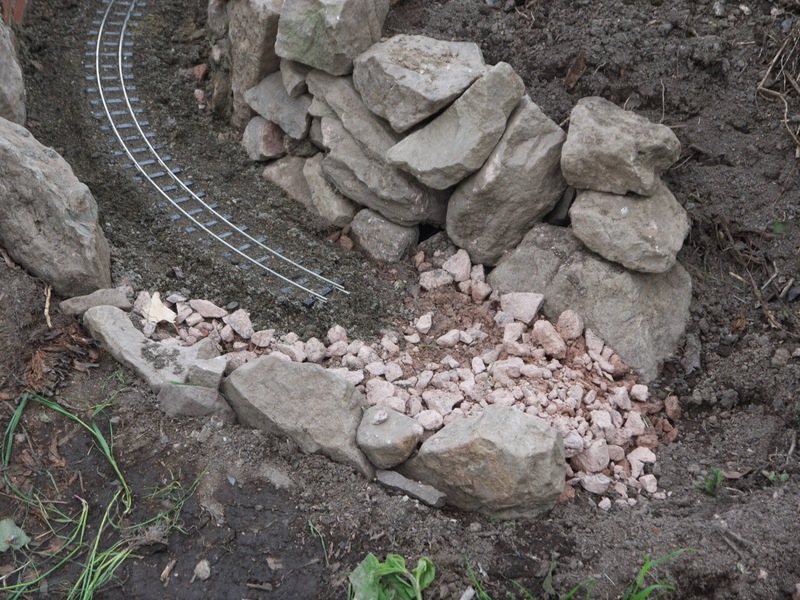 With the Eastern ledge completed, I was ready to lay the first pieces of track. As an indoor modeller, my instinct is to paint the track. But outdoors, is that a good idea? 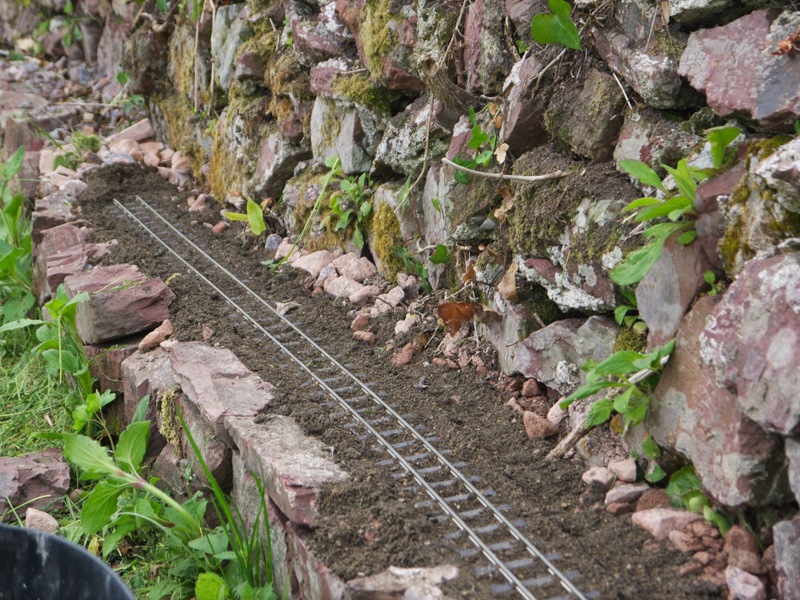 Surprisingly, when there is so much about other aspects of garden railwaying, I could find not advice about this online. So I asked on the 16mmng Email Group – wow, these guys are helpful. 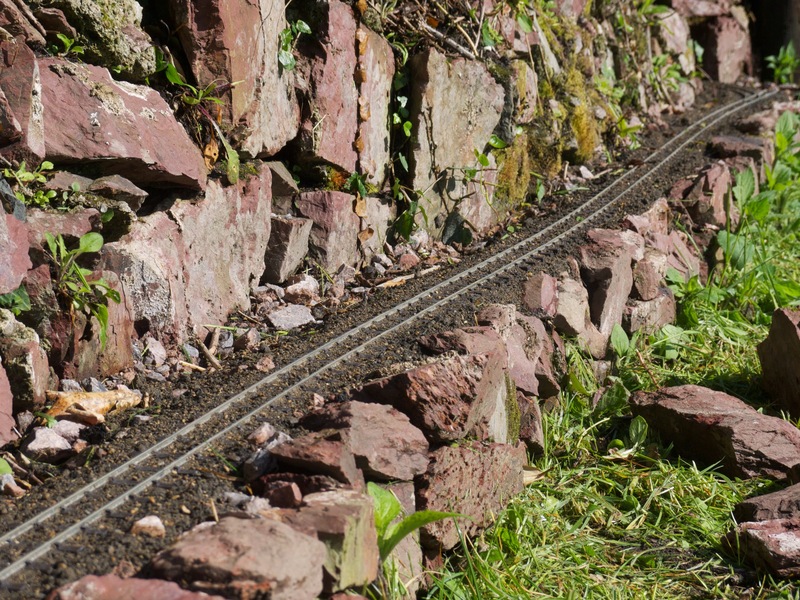 If you’re a 16mm scale garden railfarer, I’d strongly recommend joining the group. Though I’d only lurked in the weeks since joining, I got dozens of helpful answers within a few hours of my first post – with a variety of views on the matter – but I think it’s a fair summary that the general consensus was no need to paint: outdoors, nature will work on the the track (both nickel rail and plastic sleeper) to tone-down and tarnish the shiny shop-bought appearance; nature might also attack any paint causing unsightly flaking. Fine, I’m a lazy modeller, happy to do the easiest thing! 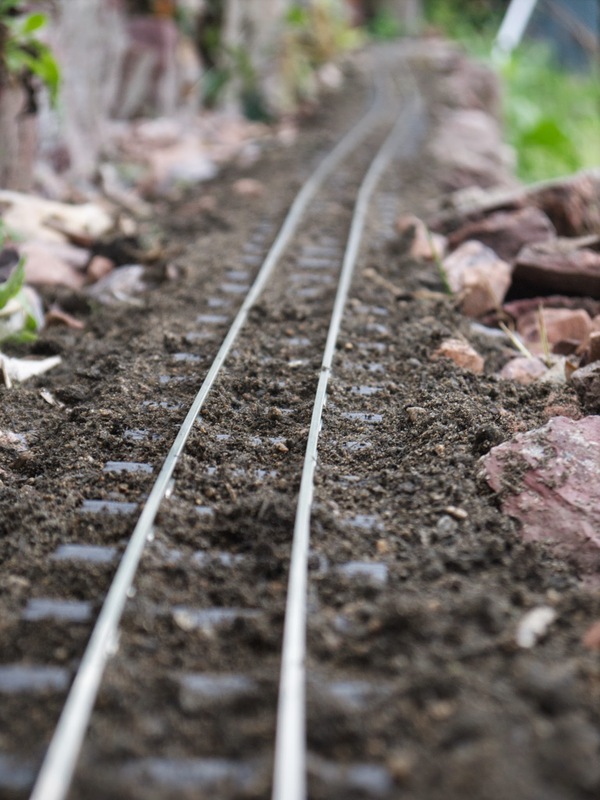 I ballasted the track with Rowlands mix – which is a mix of sharp sand, compost (to encourage moss growth) and cement (to fix it) in quantities of 2-2-1. 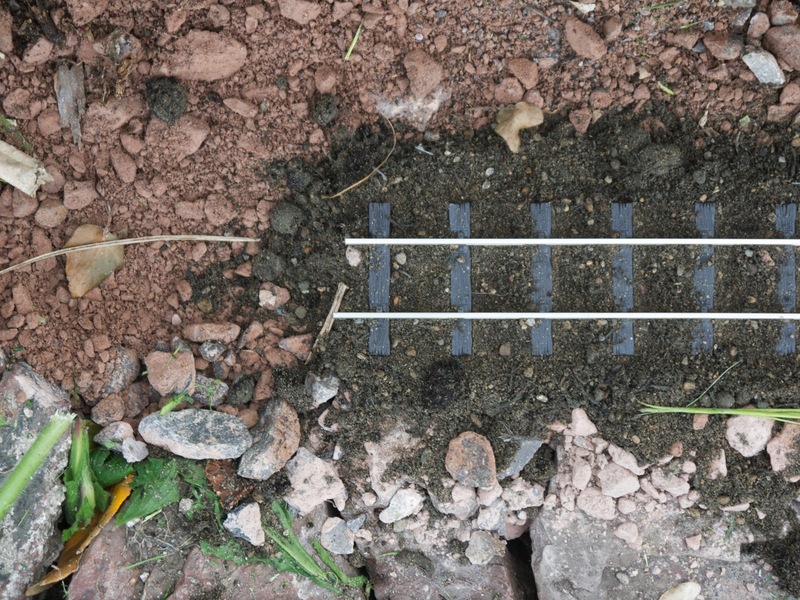 I mixed it up, laying it on dry, and using a spirit level ensure the track was a horizontal as possible. I then use an course old 2” paint brush to even out the ballast, carefully checking that the inside of each rail was free of crud. 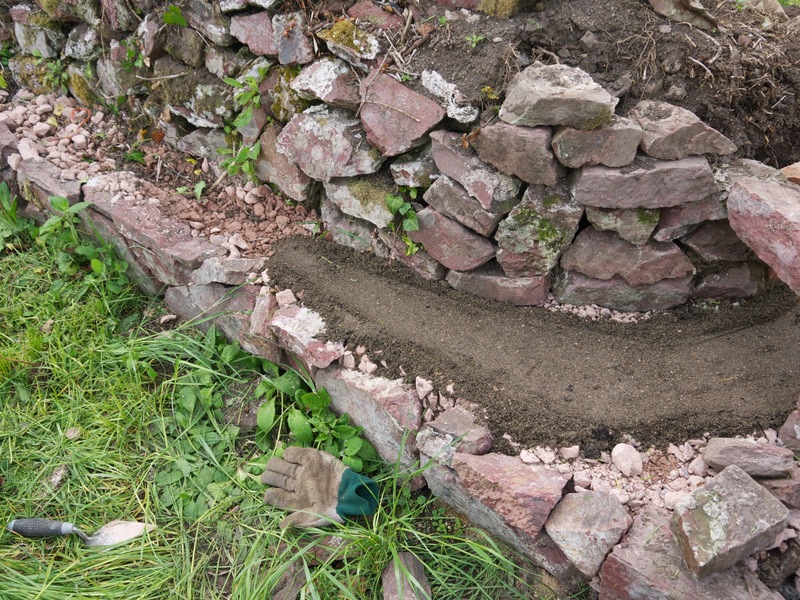 Rather than going to the trouble of dampening the mixture myself, I let the rain overnight do the job. We had just over 1” of rain. I was worried that this might have washed the cement away… but after a few days (covered with plastic), the ballast was beginning to set. The most solid part was in the tunnel-to-be (the construction of which I will cover later). 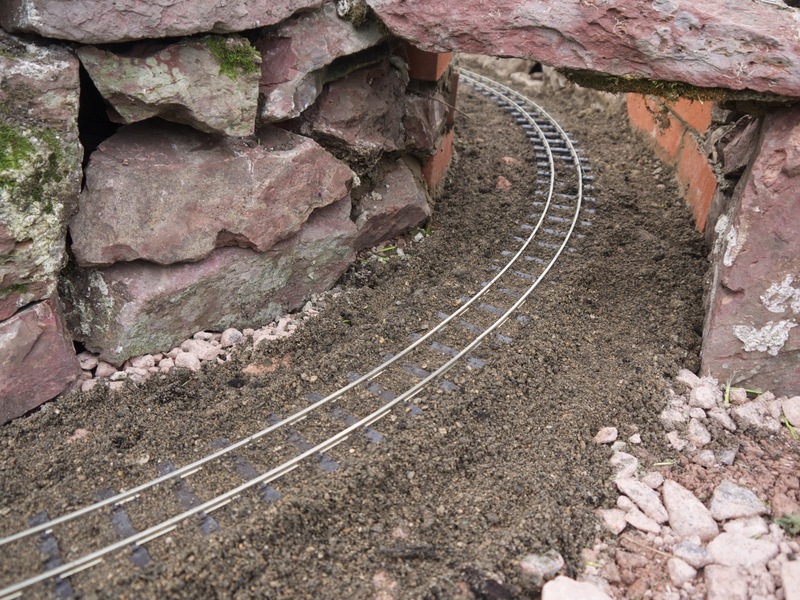 This was where I had tamped the ballast down before laying the track (though I only remembered this recently, too late for it to be a useful lesson in further track laying). I’ll admit, I was a bit excited seeing some actual track in place. Stuff just got real, as the young folk say*. * They may not say ‘stuff’. @MrSimonWood Crikey, this is exciting! Compressing it into a few blog posts makes your progress seem scarily rapid tho. @aderixon Yes. It’s laziness getting started blogging, not speed in completing the work! It’s definitely taking shape. Getting low-down and dirty I can now understand why you placed the track so close to the wall – great effect. Looking forward to the next instalment.